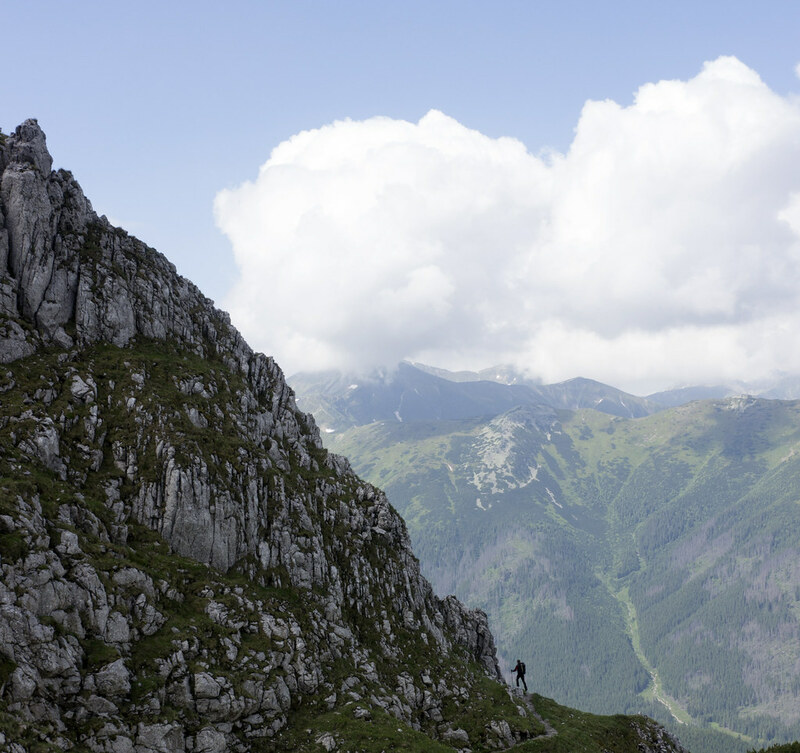 From climbing & mountaineering in the Polish Tatras to hiking and backpacking. In the rain & sunshine, up high in the mountains and low in the valleys. As we wake up at the Przedni Staw Polski Refuge and I look out from my window the mist hides the mountains and the rain drops leave little circles on the lake. Everything is wet. Marcin and I silently get out of bed and move to the big common room, give in our orders for breakfast and enjoy the tasty food that comes through the small window from the kitchen. Slowly it gets busy, people packing, but with the rain keeping up a constant drum on the roof none leave the hut. 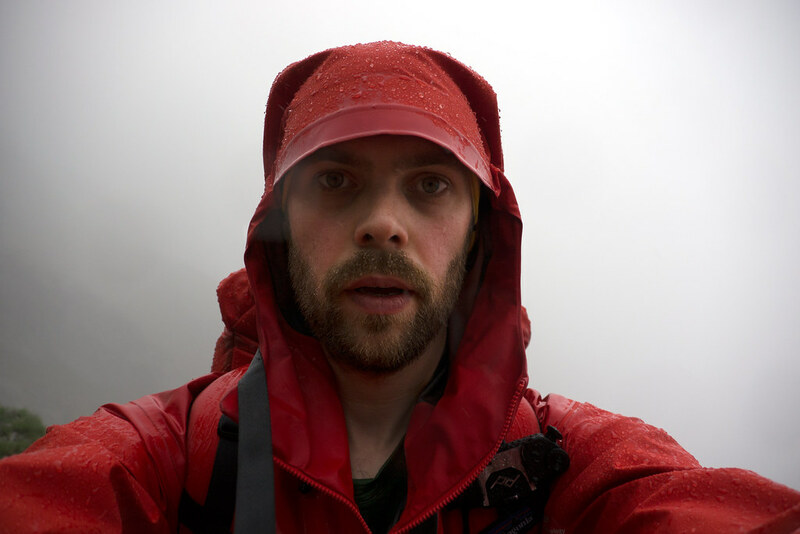 At ten we’re the first ones to venture outside, curious looks on us in our rain gear, and as Marcin tells where we headed people just look even more confused. 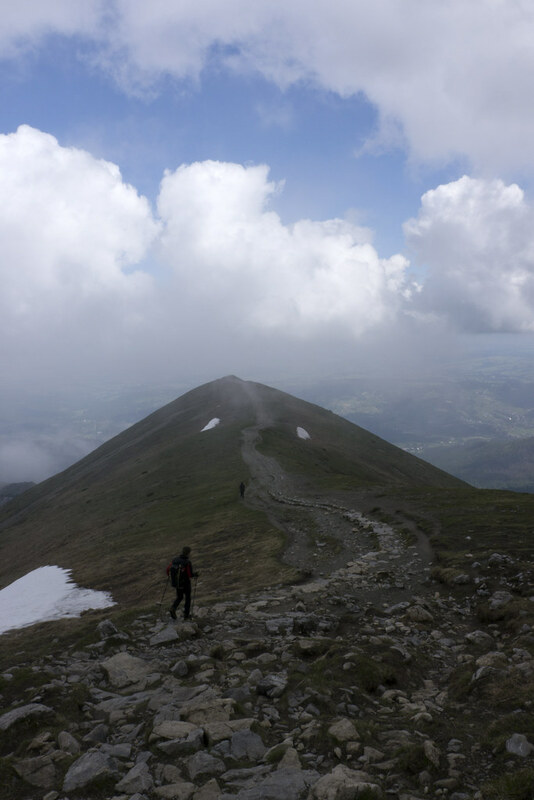 Marcin gave me a few options: Walk the easy trail through the valley to the Schronisko Murowaniec refuge, or the shorter but high route across a pass at the end Orla Perć. 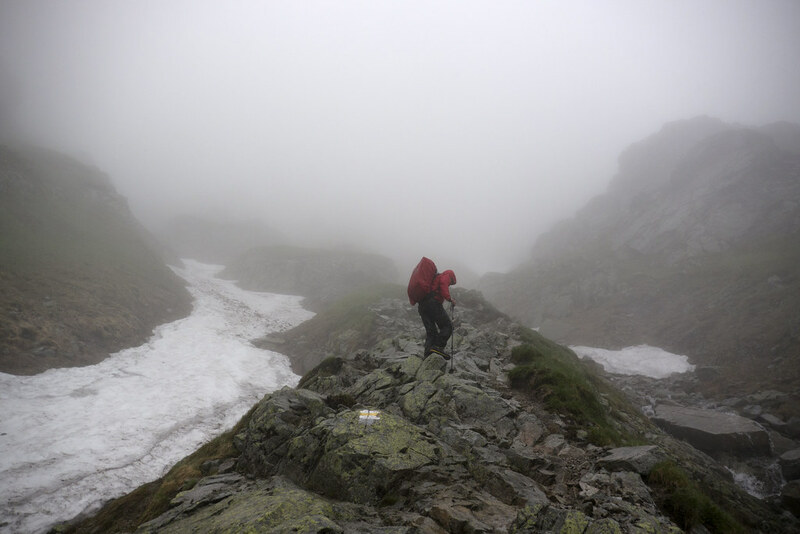 We had light packs, good gear and so it was easy to make the decision to go via the pass. I either way was a bit disappointed that we didn’t take my original route, but plans are plans: Drawn on paper, dreamed up looking over maps in the warm comfort of home. When the weather turns it’s best to adapt them and stay safe - something I can now say in hindsight. We walk by the mist-enshrouded lakes, cross the stream via the little bridge and hear the waterfall thunder down towards the valley while we slowly ascend. I carry my camera underneath my jacket so I can keep on making photos, but in the drizzle and thick mist there isn’t much to see. We cross small streams, old snow, and steadily keep on walking uphill. Once in a while the mist has a gap and we can see a bit further - the other side of the valley, further up, down the valley. To be able to continue to take photos I left my gloves in my pack - a decision I regret the higher and windier it gets. I also ponder why I decided to put on my Alpha Comp Jacket instead of my Patagonia Alpine Houdini rain jacket as I start the get wet inside - or then it’s the sweat from hiking and scrambling up? At least I’m warm and the jacket and pants keep the wind outside. 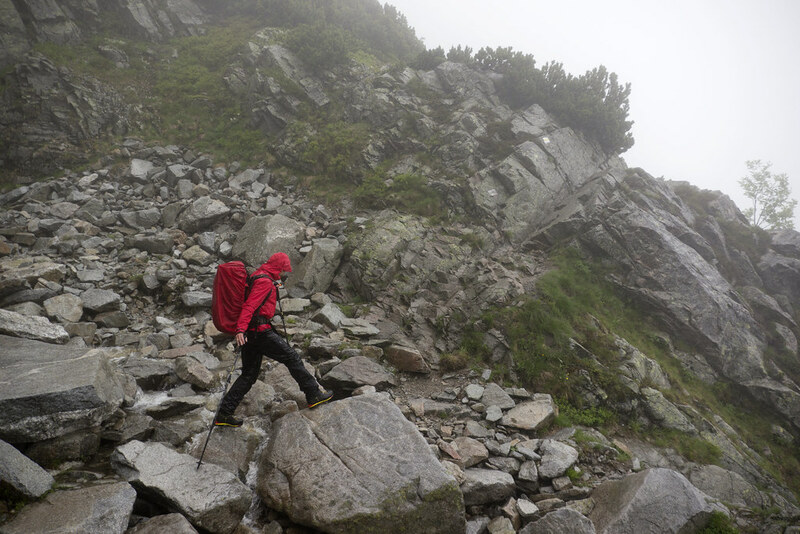 We scramble up steep passages, rain and small streams making things slippery - it’s a good thing I’m wearing my Scarpa Rebel Ultra GTX boots, that way I have good grip on the wet rocks and half-way dry & warm feet. Soaked we arrive at the pass and the wind howls past us. I shelter behind a big rock, but Marcin lets me know we should push on. So on we push. On the way up I thought about how nice it will be to go down in the downwind side. 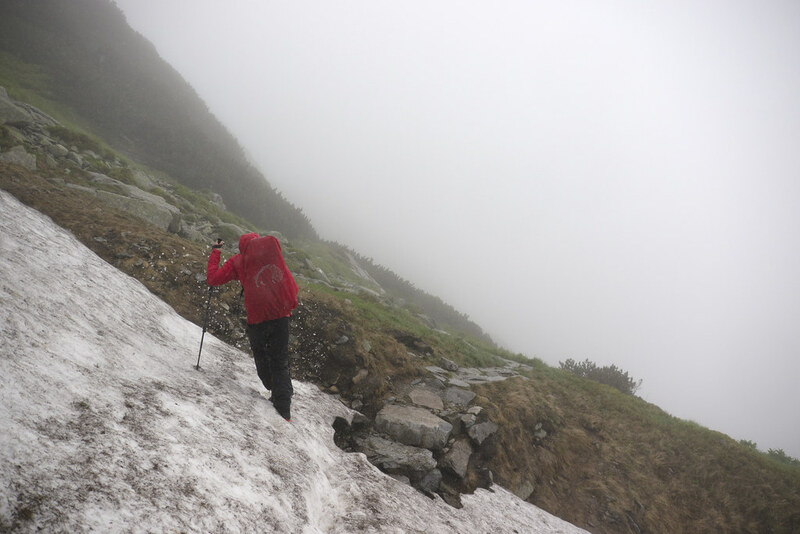 But I must have misunderstood Marcin, as we hike down on wet talus fields on the upwind side. 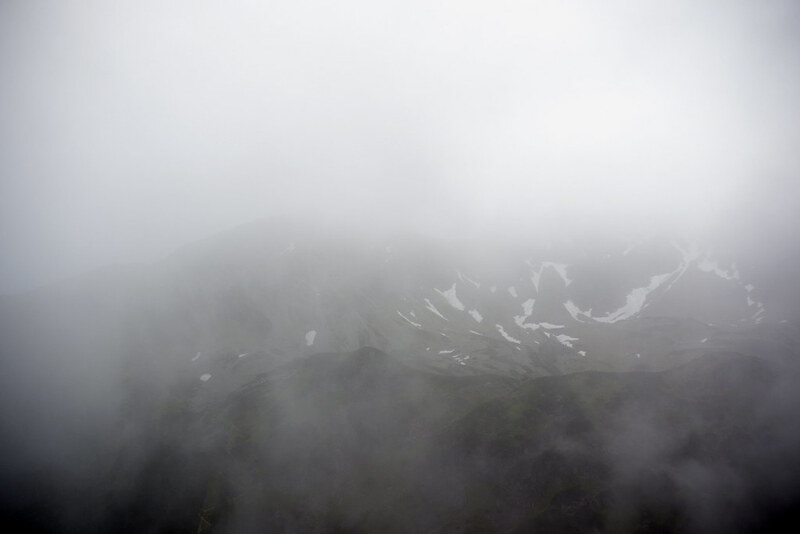 At a narrow stretch of path between the talus I finally decide to go search for my gloves in my pack, as my hands started to be just too damn cold in the strong wind. When I finally have managed to get my soaking wet & cold hands in the gloves they need a moment to warm up, but then it’s infinitely more comfortable. The same time I pack away my camera, so I can concentrate on the path. We down climbing a few sections and then slowly are getting lower. 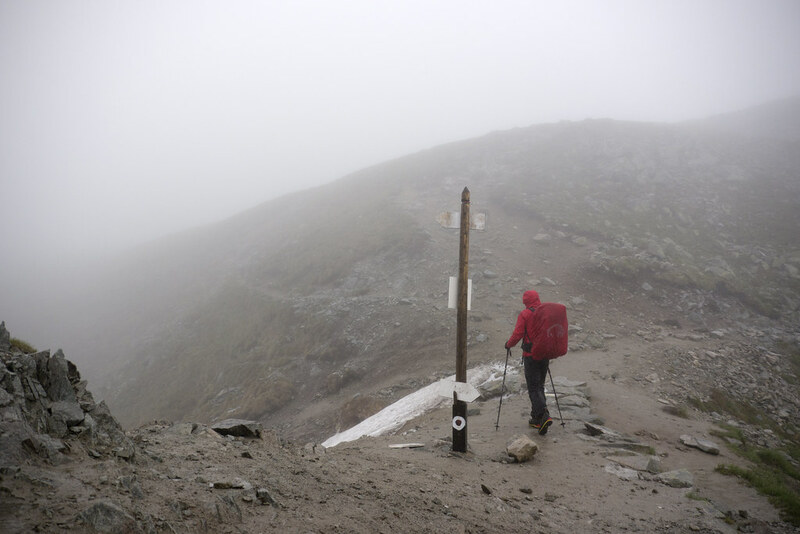 We hike over snowfields and I can believe it as down, out of the treacherous wind, we see a solitary figuring coming our way, wearing a Poncho. Marcin chats with him, and as we continue to walk I hear a similar story like the ones I have heard the days before: First time in the mountains, wants to continue to the hut we started out from. A bit later we meet a couple who also have the same plan and think that now they’re at least three if they catch up with the guy, which makes it a bit safer. We pass a high-alpine lake and low pines are starting to appear. “Not long anymore” Marcin tells me - he must see that I’m not feeling too great: By now I’m drenched. 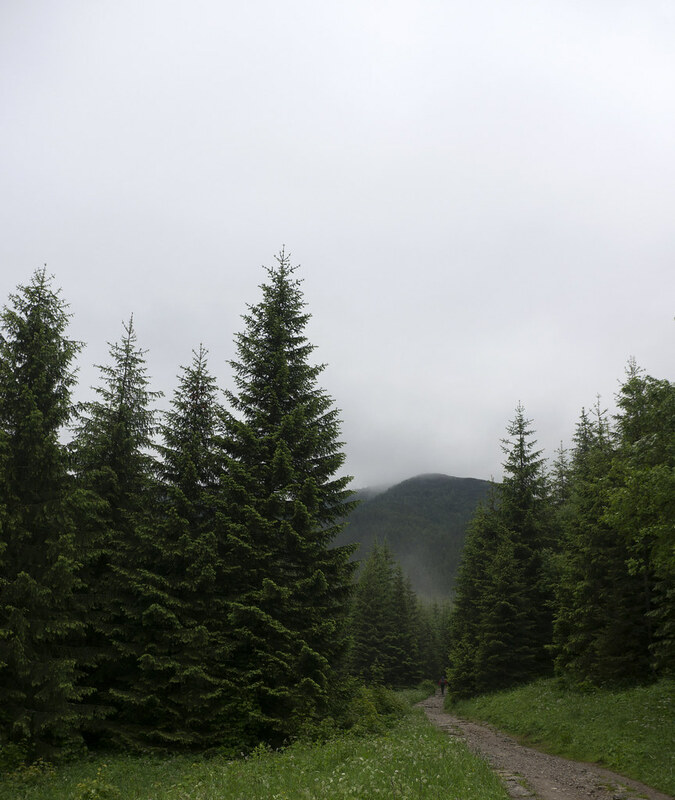 Soon we are walking through a pretty pine forest in the mist. After a final small uphill we stand in front of the massive Schronisko Murowaniec refuge. We head inside and it is full of people - some dressed in dry clothes, others looking just as wet & miserable as we. Marcin shows me the drying wall, where I hang my wet gear after I slipped into my dry layers. Then it’s feasting time - I’m starving and munch away a soup and pancakes, a hot tea and coffee give more warmth. We sit for a while at the hut, with people coming and going. My clothes still moist but a bit drier I put them back on after almost two hours inside. Outside it’s still as misty as before, but the rain has become just the faintest drizzle. 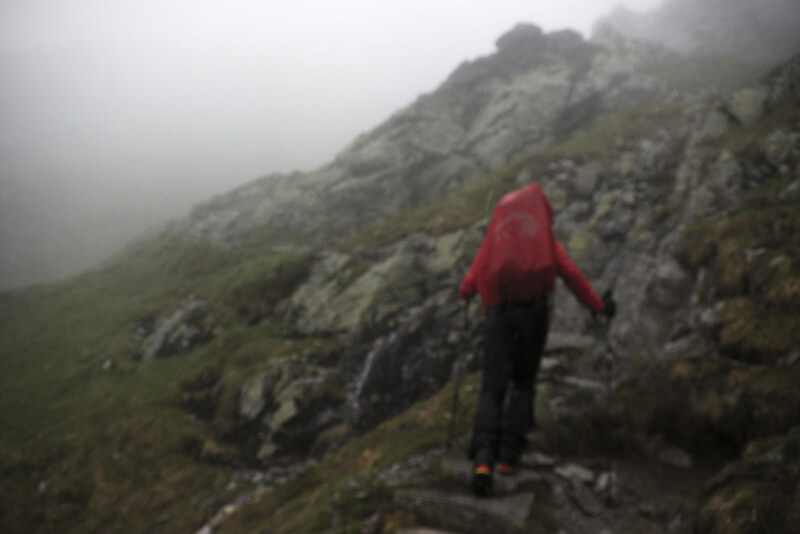 Steadily we go down, soon the rain stops while the mist lingers on. We descend on paths that get broader and broader to a wide meadow. 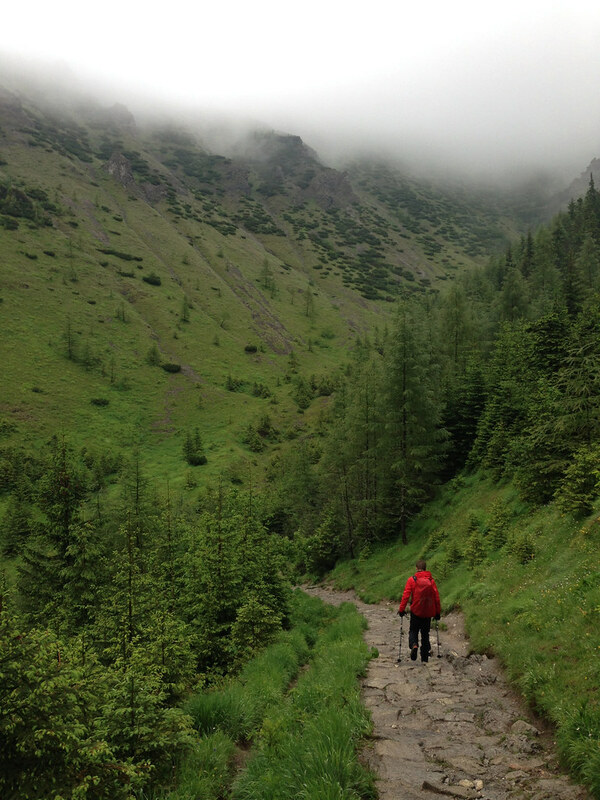 The mist mixes with the clouds and hangs above us while we walk towards Kuznice, a suburb of Zakopane and the start of a gondola up to Kasprowy Wierch. Here Marcin and I separate for a while - he needs to run an errand in town and hopes to catch a bus from here - we’ll meet up at the refuge later. 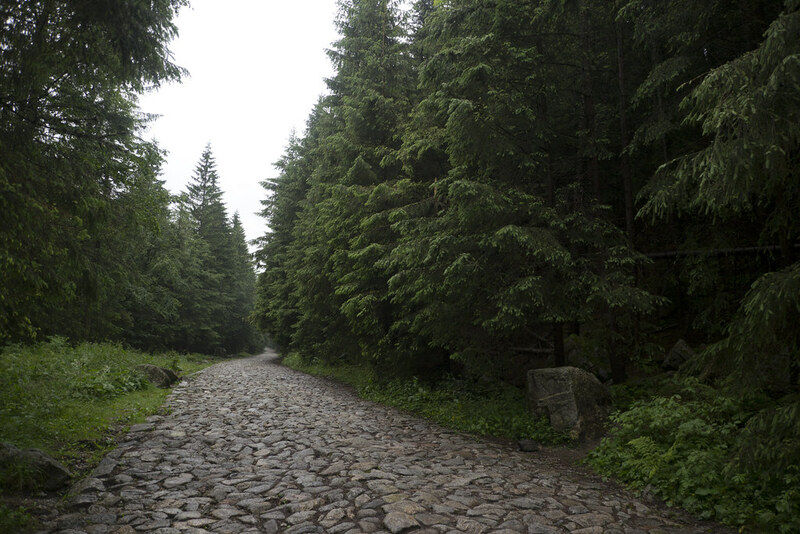 After checking out the the small settlement with the gondola station and resisting buying some more food I hike up the broad cobblestone trail and take the first possibility into the forest. 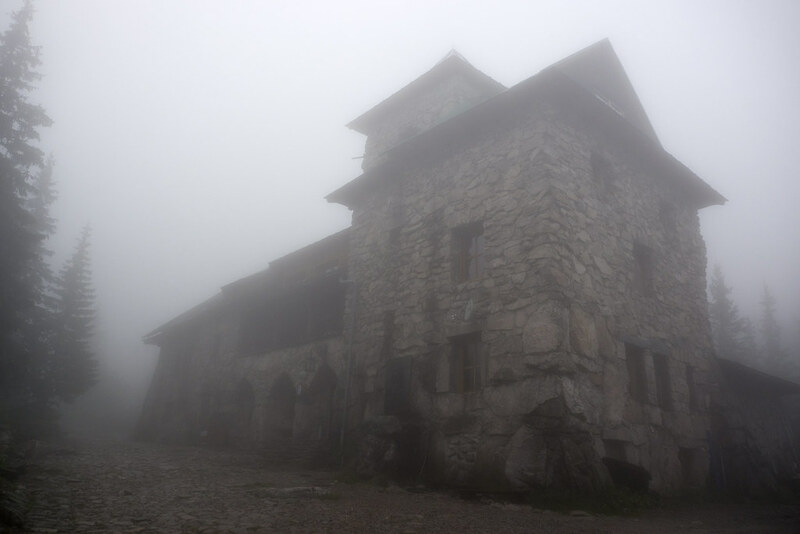 There’s several possibilities to visit shrines and monasteries along the trail, but I just want to reach the refuge to finally strip out of all the moist clothes, take a hot shower, dress in dry clothes and eat some good food. But the scenery is lovely on the way, and so I stop here and there to take photos. As the forest disappears another wide meadow comes into view, with the pretty Schronisko na Kondratowej Hali refuge sitting at its side. I go in and am welcomed by smiling faces in the common room. While I don’t speak a word of Polish I still am able to communicate with the wonderful owners of the refuge and she shows me the room I am staying in. I put down my pack, get rid of the wet clothes and then just am for a moment. Then the rest of the evening is just as I imagined it would be: Hot shower, dry, warm clothes, good food, early to bed. I slept great after the day before, and as we get up at 6 in the morning the sky is blue and the sun is already shining across the summits opposite my window. 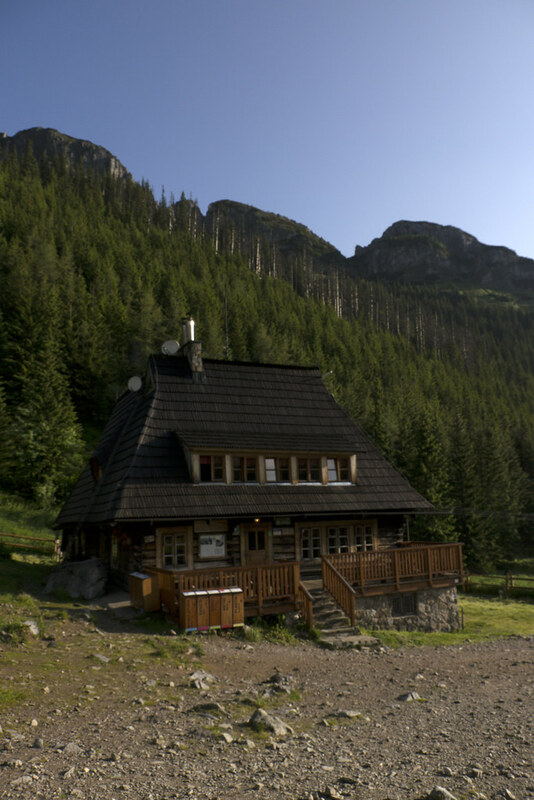 Marcin and I head silently down, where the two ladies of the refuge have a breakfast waiting for us! We eat, pack, and are out of the hut by 7 and make our way to the pass. The sky is blue with the occasional white cloud running across it and we quickly are hot from the sun and hiking. At the final spring we refill the Platypus bottles with cold, clear water and then walk on. 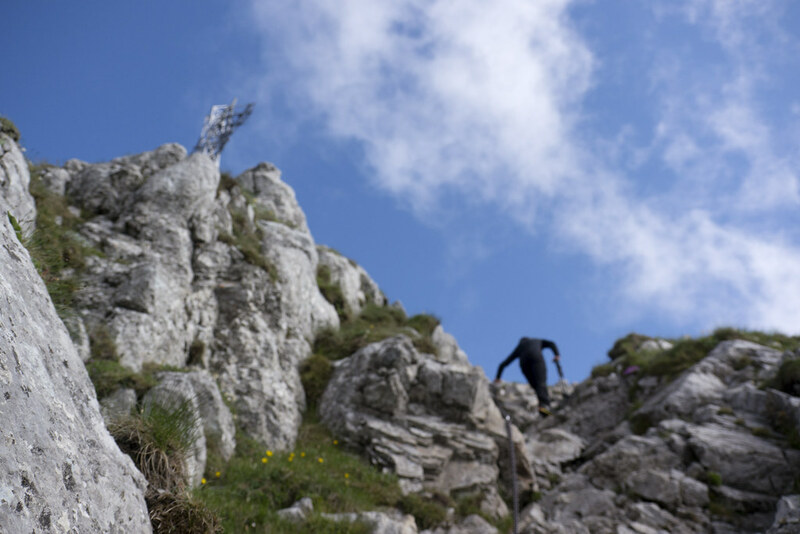 Soon we are at the pass where we drop our packs into the shrubbery and almost run up to Giewont, so light we are! 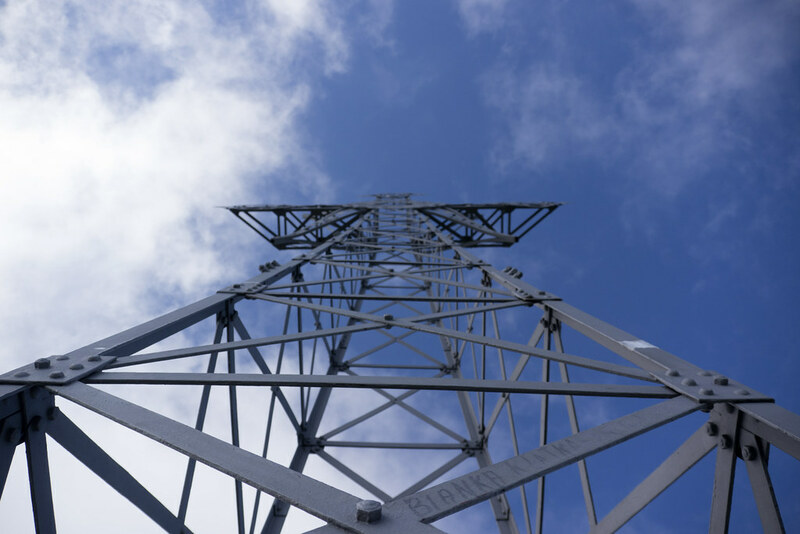 It doesn’t take us long and we’re standing on the summit, underneath the massive iron cross which can be seen from Zakopane. The views are hazy but good nevertheless: Zakopane towards the north with the small villages surrounding the city towards east & west, and you even can glimpse into Slovakia from here. 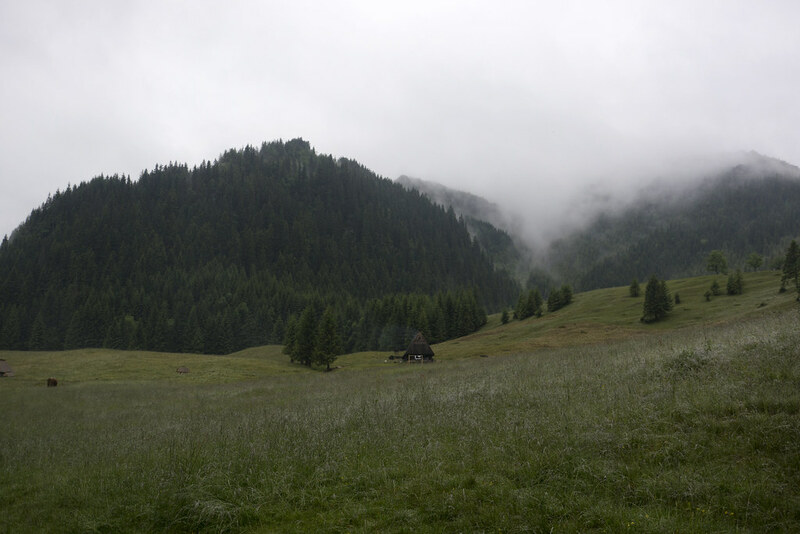 On the way down we encounter a lonely, old chamois and then soon are back at our packs. 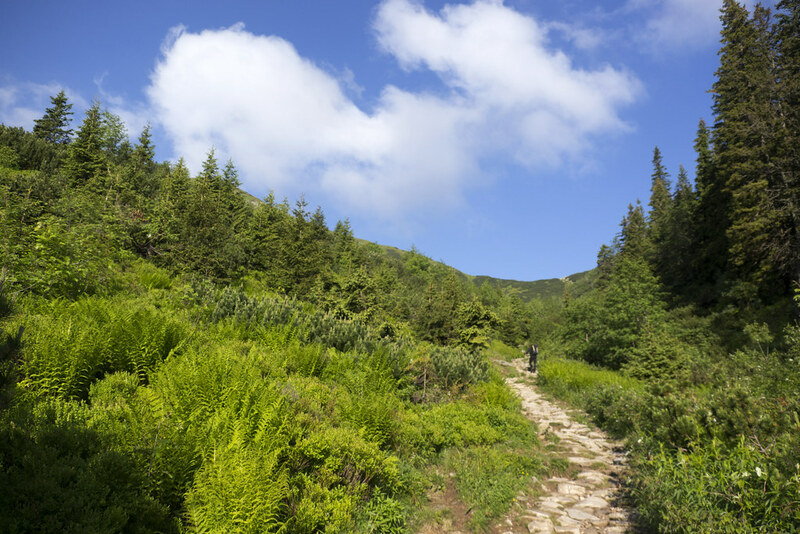 The trail to Kondracka Kopa is a long, steady climb over a wide ridge. Clouds float over the ridge and surroundings summits, while alpine flowers are adding bright colours to the grey & white of the sky. 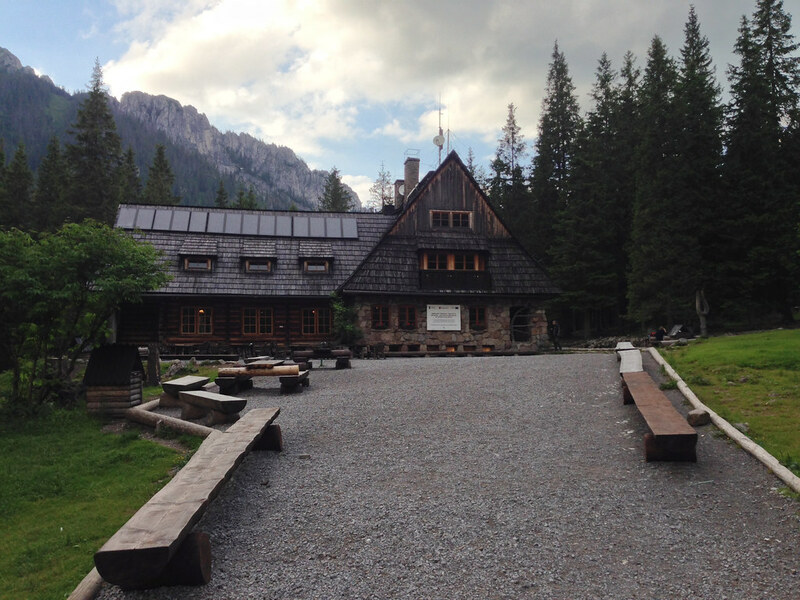 On my left I can see the lower hills of the Tatras and the meadow and refuge we slept in last night, and on the left zig-zags the trail down to the meadow from my original route. 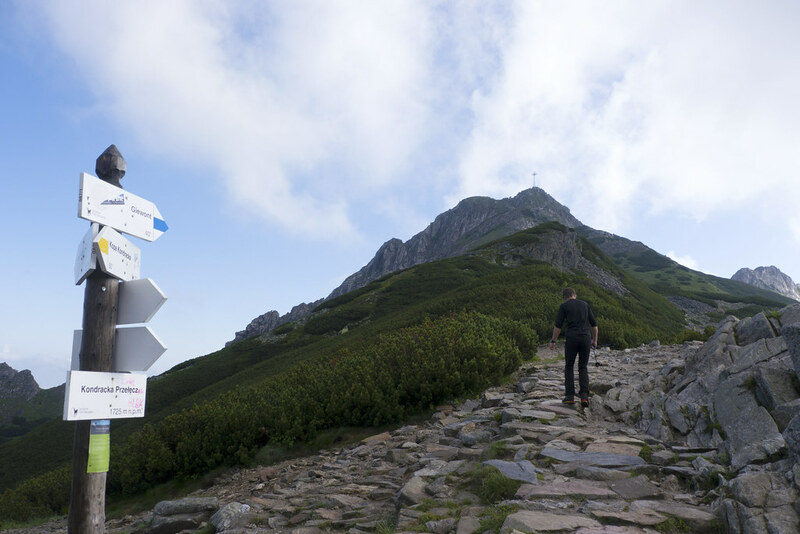 It does not take long and we’re on the summit of Kondracka Kopa, and now we will walk on the border of Poland and Slovakia while ticking off the next few summits. 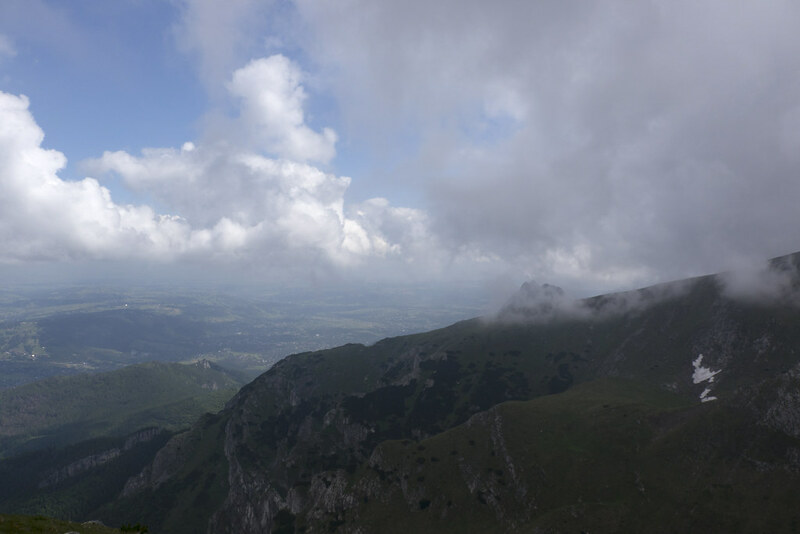 We stay now almost all the time above 2000 m elevation while we hike in the clouds from Kondracka Kopa to Malolaczniak, Krzesanica, Ciemniak and then Twarda Kopa. 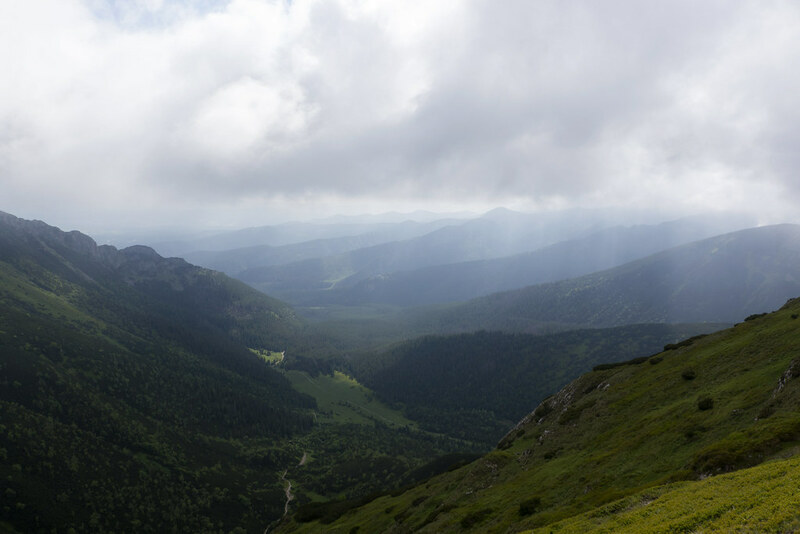 Once in a while the clouds rip open and we can see the lower Tatras in Slovakia, narrow valleys, high walls, streams running towards the far off sea. From Twarda Kopa we can see Giemont in the distance, now in the clouds - but more worrisome is the helicopter which flies up to it from the valley. We don’t know what happened, but hope no one died. 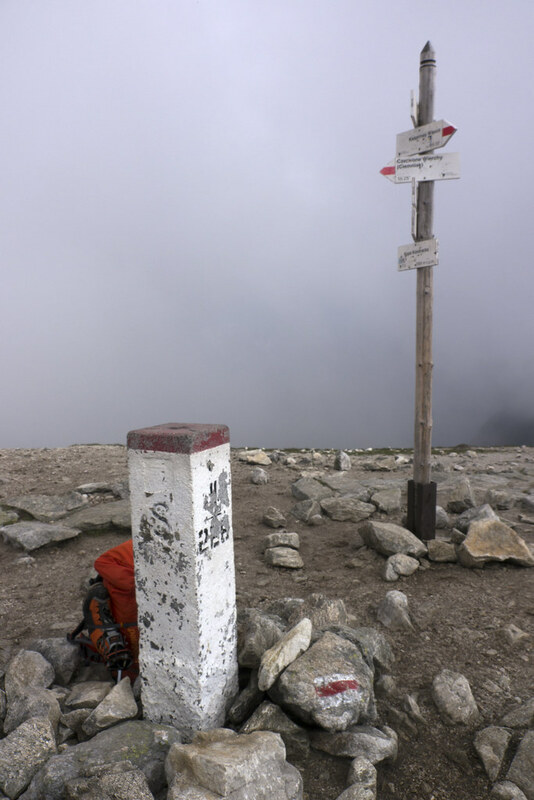 Marcin waits for me at a large summit cairn and suggests we take the green trail down to the next refuge. 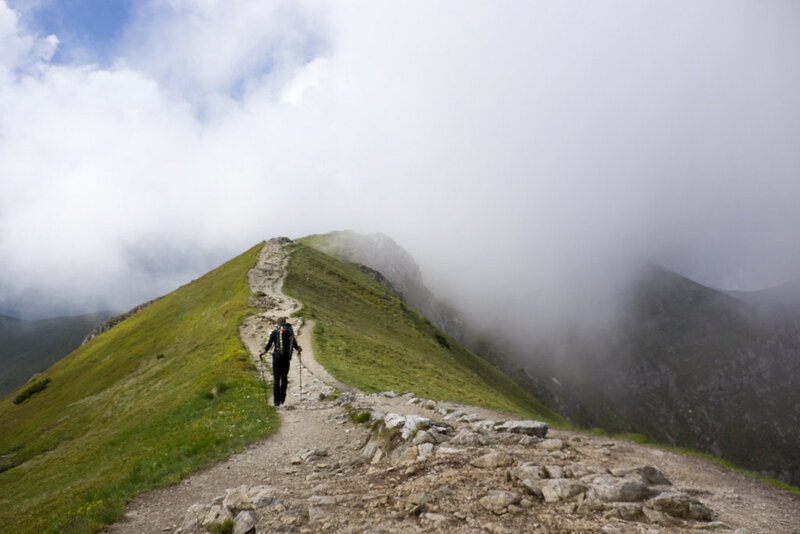 It’s just around 11 and we have the whole day really in front of us still, so I agree and we take a turn from the big main path and walk on a very narrow path in a hanging meadow towards the Western Tatras. The views and the trail are spectacular. 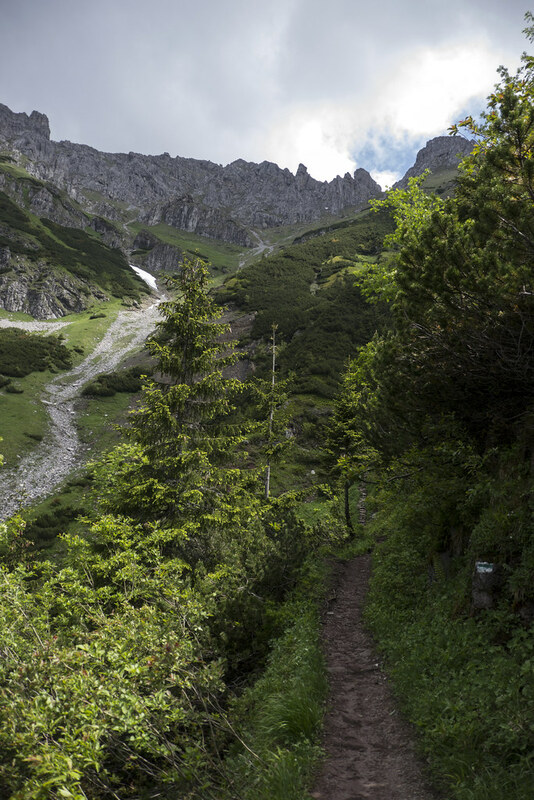 A narrow singletrack trail that’s demanding and exposed, but with gorgeous views on the lower-lying mountains, valleys, meadows - and in front of us, the Western Tatras. A pair of chamois give us a show as they are fighting in a couloir, but my view often just drifts to the horizon, where large mountains try to reach the sky with their summits. At a turn in the path we sit down and have a snack & drink, while Marcin names the peaks and valleys and tells me anecdotes about geographical features. Too soon we reach the tree line, but the path continues to be lovely. It gradually widens and Marcin tells me that it has been an old road for an iron ore mine, and I again wonder about how much work it must have been to clear the forests to create it. While we talk we reach the meadow and a group of fully loaded foreign backpackers pass us, just as amazed about the beautiful scenery around them as we are. 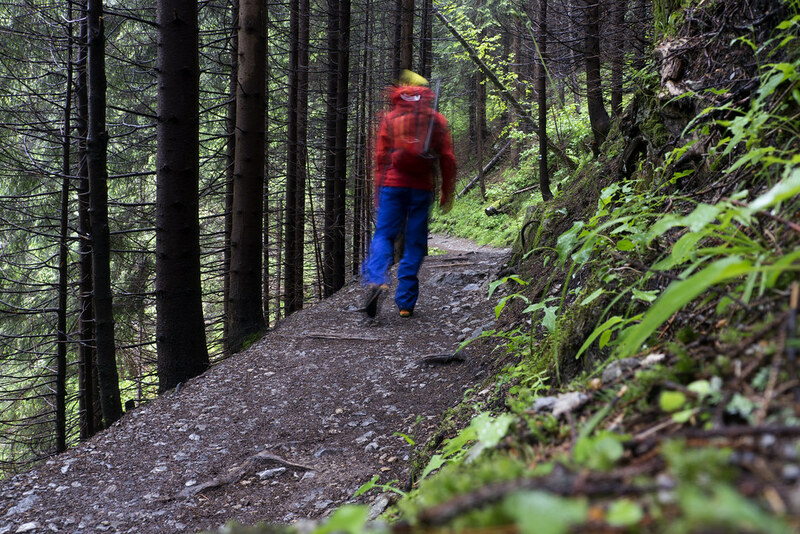 The trail now runs next to a stream, and it does not take long until we reach the Schronisko Ornak refuge. It is busy outside and not even 13 o’clock. 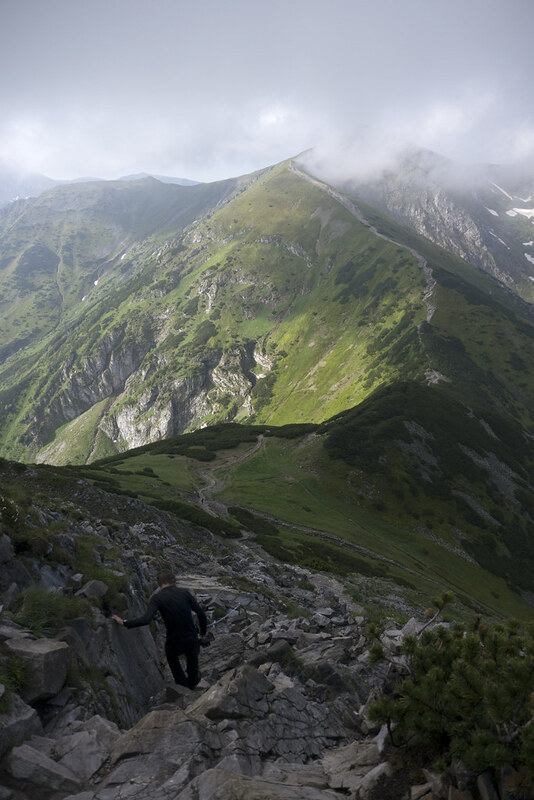 I check in with the help of Marcin and then accompany him down the valley - our hike ends here today, and I will be venturing on for the next two days on my own. The trail is now a wide dirt road and full of people, with plenty of trails going off on the right and left - trails which I will explore on my way back up to the refuge, I decide. And as Marcin tells me about the long caves up on the mountains which one can explore my afternoon suddenly looks like it will be filled with plenty of adventure!